As the fourth largest island in the Bahamas archipelago, West End, Grand Bahama encapsulates the appeal of this exotic region in a single, location. Nestled in the warm waters of the Atlantic Ocean just 60 miles east of Florida, West End is a vibrant place with hidden jewels, none more so than Nandana Private Resort. Discreetly situated within a secluded gated shoreline complex, this magical setting offers a secure retreat for up to a dozen guests, within a series of pavilions whose every surface and component oozes refinement. Designed by an internationally renowned architect in the style of an Asian beach house, an azure Caribbean backdrop with lapping ocean waves and a private beach awaits through every window and doorway at Nandana, with hundreds of palm trees and tropical plants adding bounteous shade. Asian artworks permeate every corner of the resort, including temple reliefs, hand-carved wooden sculptures and silk treasures from Thailand, Cambodia and Vietnam. Unparalleled: Many words could be expounded to capture the ethos of this palatial 18,000-square foot resort, but a glimpse of the Great Hall, which forms the centerpiece, speaks volumes. Entering through 250-year- old, 20-foot high teak doors (salvaged from a Javanese temple), the Great Hall’s vast swathes of hand-carved Burmese teak floors and ceiling extend into the distance, where the Atlantic Ocean appears to glitter atop the central dining table. With massive teak columns supporting the ceiling some 40 feet overhead, a reverential temple-like aura permeates this unparalleled space, which also contains guest areas, a library, bar and wine cellar containing 400 bottles of wine. A magnificently appointed kitchen is situated within the Main Hall, opening onto an oceanfront dining area. 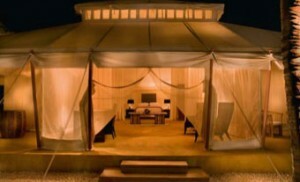 The Great Hall is surrounded by five spacious bedroom villas and a unique safari-style luxury tent suite. When the day is done and it’s time to retire, each of these pavilions offers a haven of relaxation. From flat-screen satellite TVs, iPod docks and wireless Internet throughout, to computer-controlled lighting and air conditioning, these celebrations of somnambulism have been furnished with the finest materials. Taking this philosophy one step further is the Canopy Suite, a romantic 2,000-square foot safari-style tent featuring air conditioning, Internet access and the same caliber of furnishings as the neighboring villas. One might expect such an opulent environment to offer fitness equipment, but the fully equipped gym with its cardio and weight equipment exceeds all expectations, and contains the luxury spa facility where massages are delivered by an in-house masseuse, trained at the famous Aman Resorts. Nandana’s outside areas again surpass what might be expected. A heated 120-foot infinity pool, with a waterfall seemingly melding into the ocean below, and an adjacent Jacuzzi offer a tantalizing choice of aquatic environments for enjoying an evening cocktail. From world-class cuisine to a fully equipped business centre, this resort astonishes time and again with its winning blend of residential living and the bespoke amenities of a five-star resort. Explore: In many ways, it’s hard to imagine wanting to leave this opulent haven, but the area surrounding Nandana has its own temptations. Foremost among these are world-class fishing (aboard Nandana’s own 50-foot deep-sea yacht), the adjacent Jack Nicklaus-designed 18-hole golf course, and motorized craft including jet skis, a water ski boat, ATVs and a safari-style luxury Land Rover. It’s possible to appreciate the pristine clear blue waters and abundant sea life through scuba diving and snorkeling, while more adventurous guests can experience escorted shark or dolphin dives, the richly rewarding Bahamas culture and casino nights. Security patrols operate around the clock, and this 24-hour service also extends to the resort’s staff, including an estate manager, concierge, chef, chauffeur, housekeeper and night butler.